The SkyLight connects any Smartphone to just about any Microscope! 295 backers pledged $22,727 to help bring this project to life. The SkyLight is a sleek, minimalist adapter that connects smartphones to microscopes. The smartphone camera can then capture photos and videos for uploading, e-mailing, and sharing on the web and social media sites, as well as real-time viewing on the smartphone screen or via video-conferencing software. The SkyLight is the first of its kind, as there is no other available device that attaches any smartphone to any microscope. The SkyLight’s universal compatibility allows previously owned technology (microscopes) to be upgraded to the digital age with the use of a widely available technology (smartphones) – good for global health, science classes, and anyone else! Check out our website for some images taken using the SkyLight with various smartphones and microscopes. The SkyLight holds the smartphone camera steady over the eyepiece of a microscope precisely where the image from the microscope is formed. Basically, it's like taking a cellphone picture through the microscope eyepiece. The SkyLight has been designed to be very intuitive to use – you can simply slide any smartphone into position and lock it in place. 2. Place a smartphone on the stage between the two clips. 3. 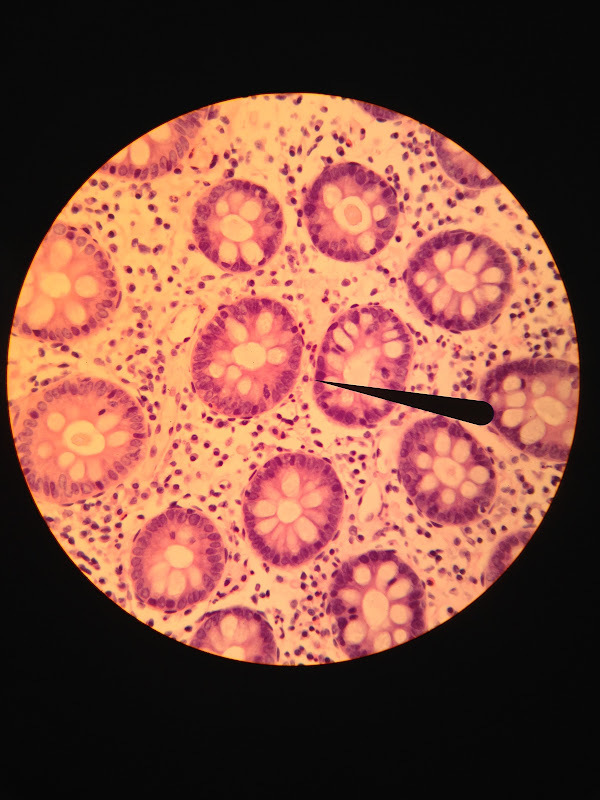 Slide the smartphone up and down and left to right until the image from the microscope is centered over the smartphone camera. 4. Slide the Skylight along the eyepiece to get a crisp image and tighten the thumbscrew to lock it in place. · Will fit any microscope eyepiece with outside diameter between 1.00” to 1.75”. The SkyLight is made from lightweight plastics so the entire device weighs only 4.9 ounces (less than an iPhone!). The stage that holds the smartphone is made of a rigid, translucent plastic (polycarbonate). The base and clips are made of a durable plastic (polypropelene) that can withstand flexing over and over again. Here are two examples of the $35 pledge reward - an 8"x10" print from a photo taken using the SkyLight. Amazing images, good quality! Impress all your friends/family/co-workers/girlfriends/boyfriends with how much you love science! Link to full size image! Andy studied bioengineering and global health at Rice University and industrial design at the Instituo di Diseno in Barcelona, Spain. While a student at Rice University, he designed and built (with plenty of help!) the Global Focus microscope - a small and inexpensive fluorescent microscope that currently has 20 prototypes being tested in the US, Central America, Africa. Now he's bent on making meaningful change through design. Tess is enthusiastic about ideas, adventures, running around like a kid, cool design projects, looking at/climbing on rocks, and reading 10 books at once. She lives in Oakland and works (from home yo!) as a geologist for an environmental consultant. While working on a low-cost microscope for developing countries Andy saw a need for a device that could help overcome a global shortage in trained healthcare workers. The Skylight has the ability to connect doctors from far away to patients in rural locations using existing technology (microscopes) and equipment that is becoming widely available (smartphones). While field testing the SkyLight in Costa Rica, Andy and Tess saw the impact the Skylight may have for education. The project has grown from there with the help of many friends. For the health worker in Malawai, Africa, the SkyLight will enable circa 1980 microscopes to send diagnostic images to the nearest doctor, who may be separated by hundreds of miles. For the middle school classroom, the SkyLight will empower students to approach microscopes, an age-old technology, as a digital device. Sharing images, either with their friends and teachers in real-time on the smartphone screen or after class with their friends on Facebook, adds a totally new element to the science classroom. So we're confident that the SkyLight will have a big social impact and make a tangible difference in individuals' lives. And it stands to do so through elegantly simple means - by enabling people to use technology already at their disposal in new ways. Kickstarters, join us and help make the SkyLight a reality. We are asking for your support of $15k. The 15k will be used to finish the design for manufacturability, packaging design, and help us set up and contact distribution channels for the donated Skylights. We want to give a special thank you to Proto Labs for their support. If we raise $15k on Kickstarter, they will award the project a Proto Labs Cool Idea! Award, providing free injection molding tooling and 25 sets of parts. More images and video coming! A thank you on a postcard. On one side of the postcard will be a cool image captured from a microscope on a smartphone using the SkyLight. An 8” x 10” print mailed to you of a cool image captured from a microscope on a smartphone using the SkyLight. The Bay Area Special! If you live in the general San Francisco area, we will come to you. We'll bring smiles (of course! ), a SkyLight, a light microscope and plenty of cool samples. Great for a school project or just a fun afternoon. Receive 5 SkyLights! Choose to keep all five, give five to your friends, or any combination of the two. You can give SkyLights to friends, colleagues, or to your child's school. Receive a SkyLight as well as a framed 11" x 16" print of an image that you pick from our photo gallery -- and as a lasting sign of our thanks, your name goes on our website (www.skylightscope.com).